Papaya is a fruit that’s quite commonly available in all continents of the world during the summer season. Rich in Vitamin A and Vitamin C, the fruit has many health benefits. The fruit, it’s seeds as well as the leaves are edible and are widely used in South East Asian cuisines. If you don’t prefer eating raw papaya, you can make a variety of dishes, smoothies and drinks and enjoy it the way you like. You can make it into a flavor you like. 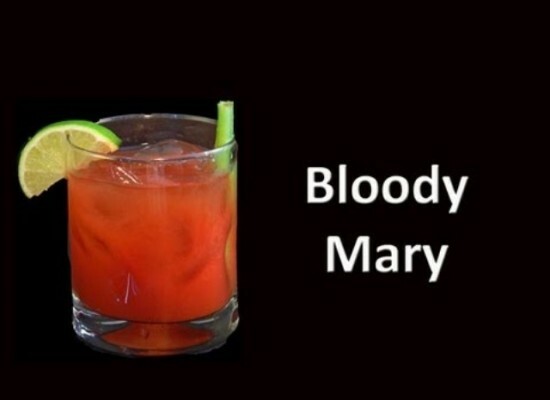 You just have to spice it up! 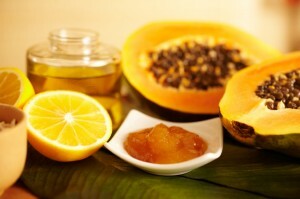 Before moving on to the various recipes let us take a look at the nutritional and health benefits offered by papaya. 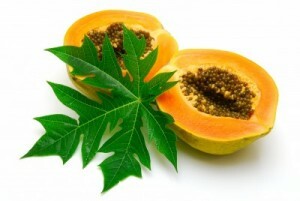 Protects Heart : As I have already mentioned, Papayas are rich in Vitamin C and Vitamin A. This makes it a wonderful element in a salad as it helps in preventing heart diseases. Vitamin A and C play a key role in oxidation of cholesterol in our body, that is they are powerful anti-oxidants. Moreover, papayas have high fiber content, which also helps in lowering the cholesterol level! Supports Digestive System and Immune System : Papayas help in improving the digestive heath and they also help in preventing colon cancer. It is also available now in tablet forms to treat digestion related problems! 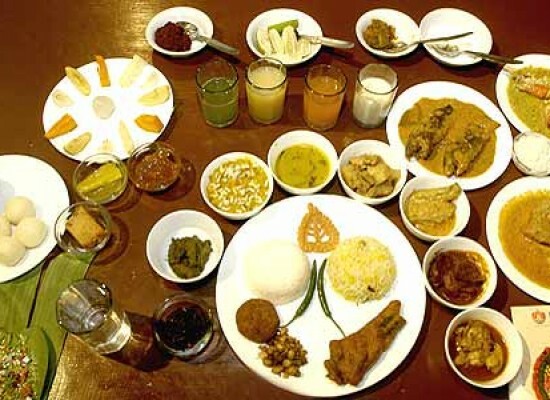 They also help in improving the immune system and prevent common illness like cold, flu, etc. Prevent Prostrate Cancer : It is widely known that, papaya when taken with a sip of green tea can reduce the risk of prostrate cancer to a great extent! Traditional Medicine To Treat Malaria : Leaves of the papaya tree are also edible and in some countries, its medicinal value is put to use. They are boiled and used to make tea, s a medicine to treat malaria. 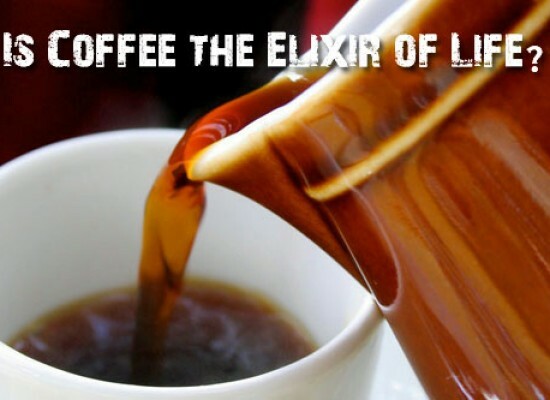 As we have now covered its health benefits and nutritional value, let’s now see some of its other uses. 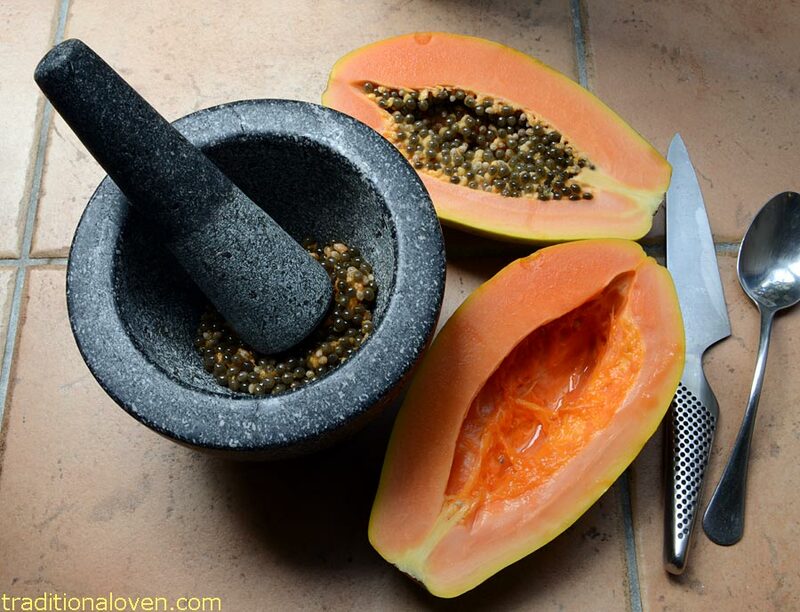 Substitute Spinach and Black Pepper : The seeds of papaya can also be used for cooking. They are spicy and are used as a substitute for black pepper in many countries. 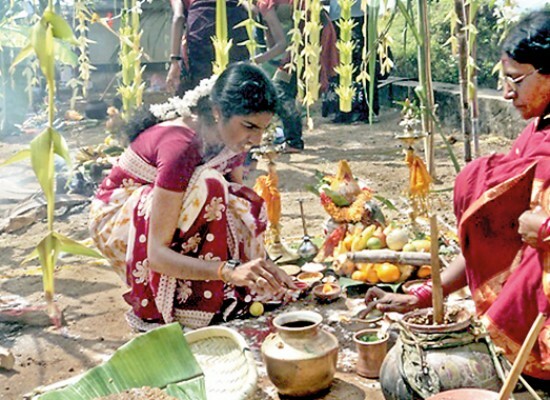 The seeds also help in destroying intestinal worms. The papaya leaves can also be boiled or steamed and cooked as a spinach! Skin and Face Mask : Papaya is one of the best face masks that help in rejuvenating the skin, heals acne and other skin infections. Apart from the above mentioned uses and benefits, Papayas can be used to make some of the best dishes. If you like juices and smoothies, sweets (halwa) or salads and salsa, papayas can blend in and create some of the delicious dishes. For those who like to eat spicy dishes, the best way to eat a papaya is to make a papaya salsa! 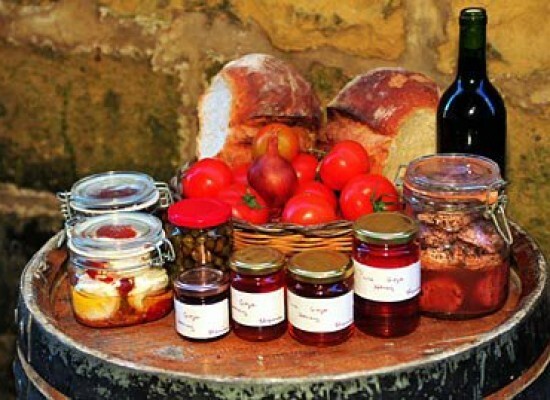 It is very easy to make as you don’t have to cook. All you need is the ingredients. Mix them, stir them well and they are ready to serve with chicken or fish! Step 1 : Peel the mango or pineapple, avocado and papaya and dice them into small cubes. Step 3 : Now mix the diced fruits, red bell pepper, onion and avocado in a large bowl. Step 4 : Add two tablespoons of the balsamic vinegar and 2 tablespoons of the chopped fresh cilantro. Step 5 : Now stir the contents and add salt and pepper to taste. 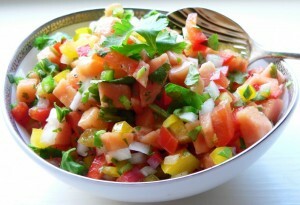 Step 6 : Let the mix for sometime and after 15 minutes, the Papaya Salsa is ready to serve. 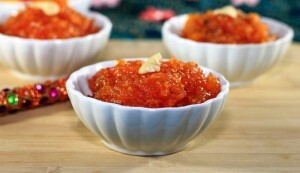 If you are a lover of sweets and desserts, you can make use of the fully ripened sweet papayas to prepare Papaya Halwa. Here is the recipe for Papaya Halwa, one of the best delicacies to serve during dinner, festivals and parties. It can be served as a dessert! Step 1 : Take a fully ripe papaya, peel off the skin and dice it into small cubes. You can also grate the papaya with grater so that it will be easier to mash it. Step 2 : Pour some oil or ghee in a pan and heat it. Now add the diced / grated papaya in the pan. Keep the stove on low flame for about 15 minutes and stir the papaya often until it is well cooked. Step 3 : Add the required amount of sugar, and mash the mix with a potato masher. 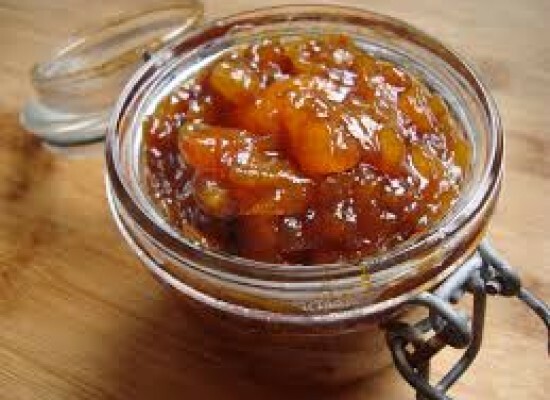 It will slowly lose its opacity and start to release the juices which will it easier to mash it as well. Step 4 : About 20 minutes later, the color and consistency of the mix will change considerably and it will become thicker. Step 5 : Now add the cardamom powder and the almond powder/milk powder/coconut powder. Step 6 : Now let it cook for 5 more minuted on low flame, stir it well and add cashew nuts. Step 7 : Stir for 2-3 more minutes and the Papaya Halwa is all ready to serve! If you are looking for a refreshing drink that supplies energy after a tiresome day at work, you can make this quick drink, Papaya-Melon Tango. 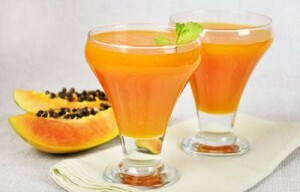 Papaya-Melon Tango is a rich source of glucose and provides immense energy after an exhausting day. Add the diced papaya and muskmelon in a mixer along with the lemon juice and crushed ice. Turn on the blender until the mix turns into a smooth liquid and the Papaya-Melon Tango is ready to serve! The above mentioned ingredients makes 2 glasses of Papaya-Melon Tango. Place it in a fridge to keep it cool.